Mrs. Prindables started with one mission: to perfect the gourmet caramel apple. It started with an addiction to the indulgence of sultry, sweet apples combined with the nostalgia of eating this well-known and loved treat. For more than 25 years, Mrs. Prindables has been creating some of the most ornamental, fun and of course, tasty treats ever seen. Their gift baskets are equally impressive – featuring apples, chocolate-dipped items and even handmade caramels and chocolates. A gift basket full of gourmet caramel apples. Who can say “no” to that!!?? 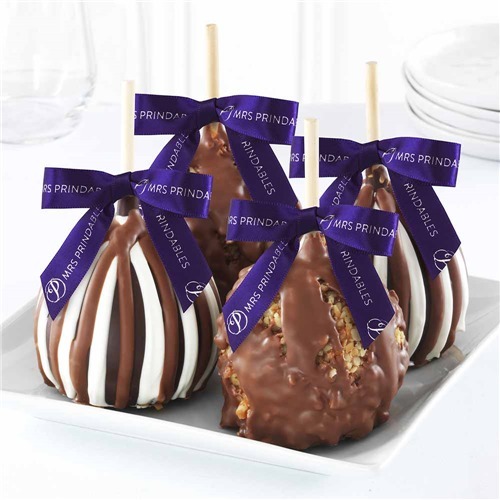 Mrs Prindables specializes in gourmet caramel apples; therefore, all of their baskets will contain a signature caramel apples. You can choose from baskets with only caramel, chocolate and varieties of apples or you can opt for ones that also include chocolate-dipped pretzels, handmade chocolates and caramels, nut clusters, and toffees. 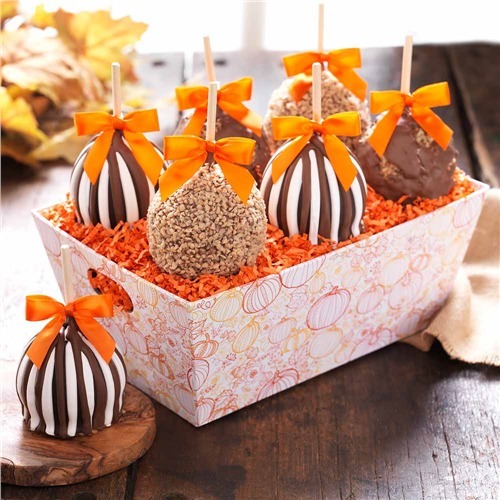 Because they specialize in only caramel apples, they do not have non-edible baskets, but their devotion to perfecting the caramel apple more than makes up for that. All of the gift baskets from Mrs. Prindables come as-is and cannot have items swapped out or exchanged. They also do not offer a design-your-own option at this time, but they are not the only vendor to do that. In fact, a large majority of gift basket companies do not let you customize the basket and instead you must pick between their pre-made options. Mrs. Prindables offers several themed and sentiment-ready basket options. For holidays, they even have special flavors and decorations. Holiday-wise you can choose from themes such as Thanksgiving, Hanukkah, Christmas, Valentine’s Day, Mother’s and Father’s Day, Easter, the seasons and Halloween. Sentiment-wise, they have a few different options, including anniversary, birthday, congratulations, get well, housewarming and even a graduation or new baby option. All of the apples included in Mrs. Prindables baskets are Kosher Dairy and monitored by the Chicago Rabbinical Council. Certain options are available gluten-free as well. They have a full list of their gluten-free products on their FAQs page so that you could make sure you’re not ordering a basket with a gluten-containing item. At this time, they don’t have vegan or sugar-free varieties. Mrs. Prindables has an excellent corporate gifting option. They let corporate customers shop now and ship later – so they can preorder gifts for customers and employees. They can also ship to multiple recipients – sending the same basket to multiple individuals at a single time. 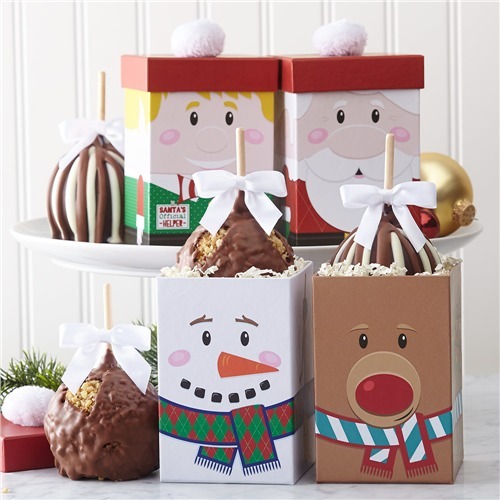 The site has a wide selection of corporate-ready caramel apples and gift baskets, including holiday themed baskets. Mrs. Prindables is also one of the few that offer personalized and branded corporate gifts. They can imprint logos, messages and more right onto the side of an apple. 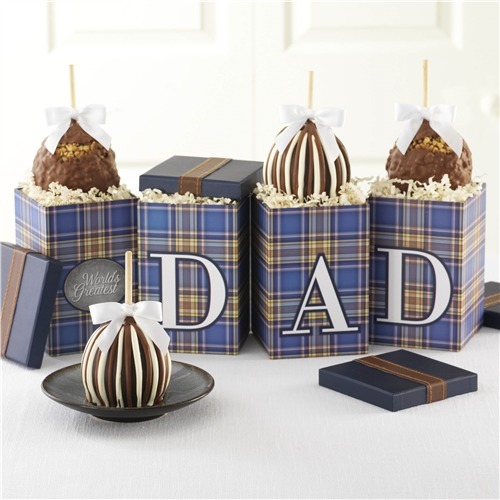 There is a minimum order of 24 units for these personalized apples, but they can be ordered individually or in a gift basket (gift baskets do not require bulk orders). Corporate orders can also be customized right down to the ribbon color for branding purposes. They have a customer service line just for corporate clients and volume discounts are available – ranging from 5 to 20 percent. Any order with $600 or more qualifies for the automatic 5 percent discount. The quality of product is exceptional, which means you can expect to pay a little more for Mrs. Prindables. 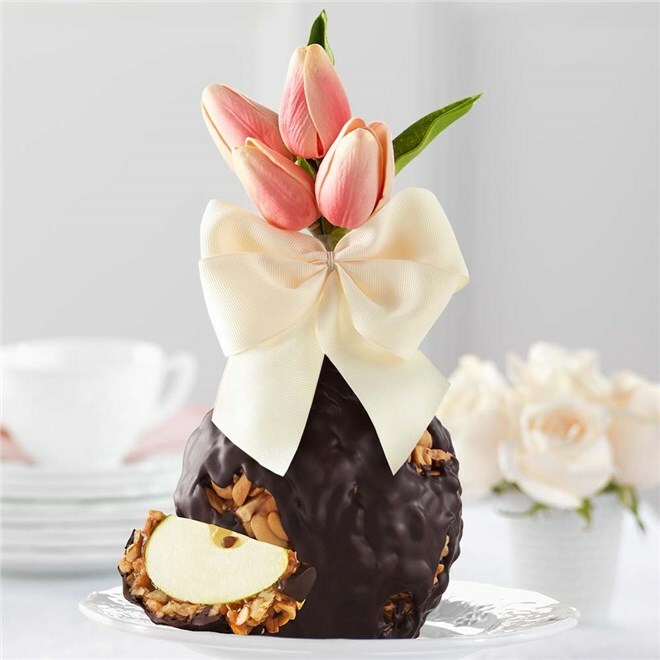 While they have a higher price point average, you are receiving handcrafted gourmet caramel apples that are made and shipped with quality and freshness in mind. The typically dip and roll the apples and ship them out the same day or within 24 hours – while other gift basket companies have merchandise that can be several weeks old. On average, Mrs. Prindables baskets will range from $29.99 to over $100. 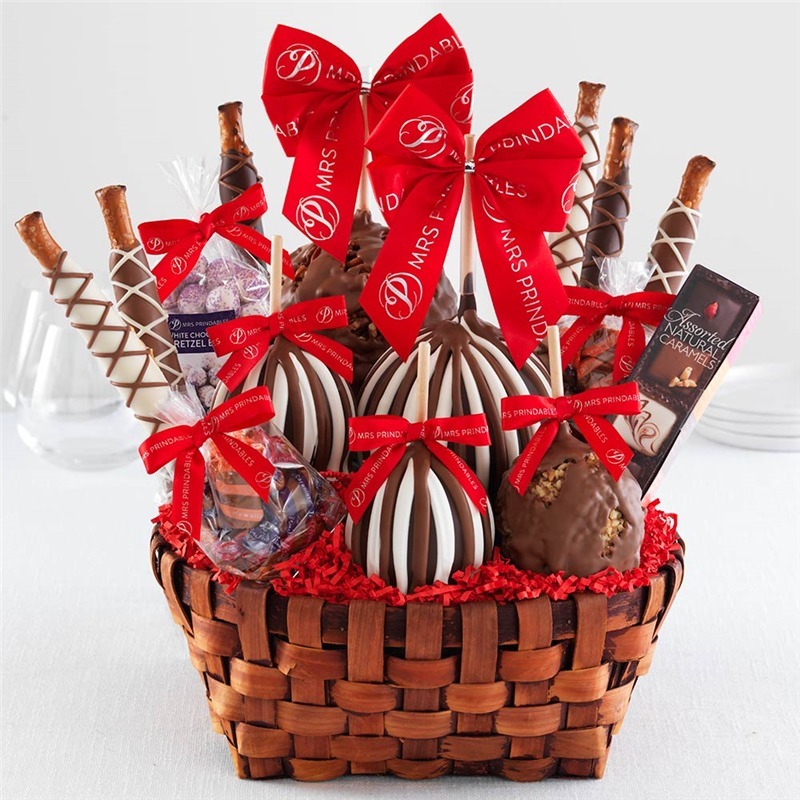 A $49.99 basket comes with three signature apples, chocolate and caramel dipped pretzels, chocolate covered caramels and pretzel bites while a basket costing $159.99 comes with eight apples, tons of packaged chocolates and candies and caramel and chocolate dipped pretzels. The sizes of their baskets for the price are impressive as well. Their baskets under $50 are still over 10 inches in size and their baskets for $100 or more average 16 inches. The shipping cost for Mrs. Prindables is comparable and based on the order total. For example, a $29.99 basket will cost $10.99 in ground shipping. Their maximum transit time for orders is three business days due to quality – which makes their shipping relatively affordable when you can order and receive in the same week. They do offer two-day, overnight and Saturday delivery as well, which goes up considerably in price. They do offer same day shipping as long as the order is received by 12:15pm their time. They deliver to 48 states, including Alaska and Hawaii. At this time, they do not offer shipping to APO/FPO addresses nor do they have international delivery. In the summer, the company will use specialty cartons and ice packs to protect the merchandise from melting and they will require faster shipping – and not offering three-day shipping. The baskets with Mrs. Prindables are attractively packaged and they take great pride in ensuring their products arrive without bruises or damage. The apples will typically last for a few days, while their prepackaged treats last up to three months. The baskets are much sturdier than other gift basket companies and the entire package is wrapped to keep the apples and treats from shifting during shipping. Mrs. Prindables has a quality guarantee. All apples are made to order and shipped to ensure maximum freshness. If someone is not satisfied with their caramel apples or other handmade confections, Mrs. Prindables does offer refunds and exchanges depending on the situation. If an order is not received as it was placed, they will work to make it right. If there is an error during shipping or something arrives damaged, they encourage customers to contact them so that they can correct the issue. Mrs. Prindables is open seven days per week via their toll-free customer service line and email option. They are on CST time and when they are not open, they have order status pages and account pages for customers to monitor their pending orders. There is a FAQs section online as well that discusses product information, shipping and ordering. Mrs. Prindables has an A+ rating, which is one of the highest we have seen for gift basket merchants. Unfortunately, despite all of this, Mrs. Prindables is not responsive – even with all of their options for contact. Our own team has attempted multiple times to reach Mrs. Prindables customer service and all without response – and this has gone on for several weeks. Considering how they do not respond to general inquiries, we are concerned that this lack of response will spill over into customer issues; therefore, we had no other option but to lower their score for customer service. Free shipping is not available on any of Mrs. Prindables products. Under $50 – Baskets under $25 typically include hand-dipped and crafted chocolates (including plenty for under $10) and then baskets with up to three jumbo apples or up to six petite apples with a mixture of candies and pretzels. 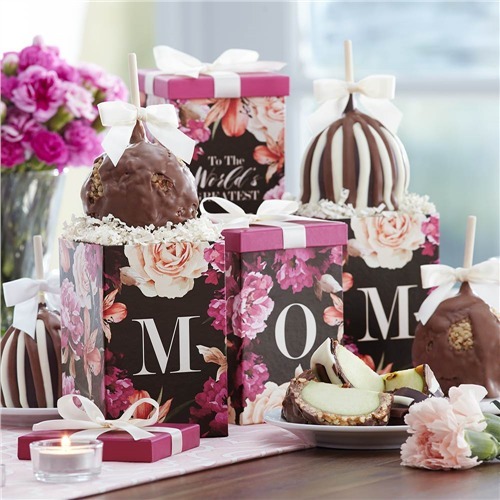 $50 to $100 – Baskets in this price range give even more, including up to eight petite apples or up to four jumbo apples alongside a robust collection of chocolate/caramel dipped pretzels, handcrafted candies and more. $100 to $200 – Baskets that start at $100 and up are quite beefy. They feature anywhere from six to eight apples, tons of hand dipped chocolates and caramels and often average 16 inches in length and 12 inches in width. Mrs. Prindables is ideal for those that are looking for a fun, unique gift basket. While some vendors dabble in caramel apples, this is the only merchant that specializes in them and their quality and creativity speaks for itself. Even those on a budget will find enough selection and those shopping for corporate gifts will be pleased at all the customizability and branding opportunities too. Mrs. Prindables is definitely unique – and we appreciate that. We love how devoted they are to that nostalgic crunch and sweetness of a caramel apple, but they take it up a notch and add a gourmet twist. All of their chocolates, hand dipped pretzels and homemade caramels are extraordinary an their attention to high-quality ingredients is apparent in every product they sell. Their shipping prices are excellent, freshness is always guaranteed, and the company gives you a lot for your money – especially in comparison to other gift basket merchants. Overall, there is ton to love about Mrs. Prindables. We also appreciate their corporate options and how they incorporate branding and messages into their gifts – something most companies cannot boast about. If we had to pick a “negative” it would simply be that you will pay more in shipping in the summer, but if you had to choose between a few extra bucks for two-day shipping or melted, rotted apples, we’re pretty sure you would opt for the expedited shipping option. Under $50 - Baskets under $25 typically include hand-dipped and crafted chocolates (including plenty for under $10) and then baskets with up to three jumbo apples or up to six petite apples with a mixture of candies and pretzels. $50 to $100 - Baskets in this price range give even more, including up to eight petite apples or up to four jumbo apples alongside a robust collection of chocolate/caramel dipped pretzels, handcrafted candies and more. $100 to $200 - Baskets that start at $100 and up are quite beefy. They feature anywhere from six to eight apples, tons of hand dipped chocolates and caramels and often average 16 inches in length and 12 inches in width.